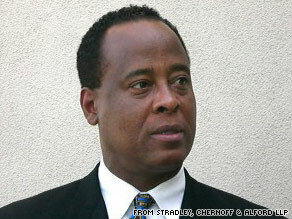 Texas authorities released court documents Thursday detailing the items seized from the medical office and storage unit of Dr. Conrad Murray, the cardiologist who was with Jackson when he fell ill and died on June 25. Detectives searched both sites in Houston on Wednesday for “evidence of the offense of manslaughter,” according to court documents. Murray’s attorney confirmed the search Wednesday. Among the items removed from Murray’s office were a computer; 27 tablets of Phentermine, a prescription-strength appetite suppressant; 1 tablet of clonazepam, an anti-anxiety medication; and some Rolodex cards. From Murray’s storage unit, authorities removed two computer hard drives; an “important contact list”; a suspension notice from Houston’s Doctors Hospital; notices from the Internal Revenue Service; and a list of medical and hospital documents. Jackson’s former nurse, Cherilyn Lee, was also approached on Wednesday by investigators who wanted copies of medical files she had on the singer, Lee told CNN’s Nancy Grace. Lee said she handed over the files to officials with the coroner’s office. Ed Chernoff, a Houston lawyer hired by Murray soon after Jackson’s death, confirmed that Los Angeles Police detectives and federal Drug Enforcement Administration agents used a search warrant to enter Murray’s office in northeast Houston on Wednesday morning. “The search warrant authorized law enforcement to search for and seize items, including documents, they believed constituted evidence of the offense of manslaughter,” Chernoff said in a written statement Wednesday. Chernoff said members of Murray’s legal team were at the medical office during the search, which he said “was conducted by members of the DEA, two robbery-homicide detectives from the Los Angeles Police Department and Houston Police officers.” “Law enforcement concluded their search around 12:30 p.m. and left with a forensic image of a business computer hard drive and 21 documents. None of the documents taken had previously been requested by law enforcement or the L.A. coroner’s office,” Chernoff said. Tammy Kidd, a spokeswoman at Chernoff’s office, said the search “was absolutely a surprise to us, because we’ve had open lines of communication this whole time.” “Based on Dr. Murray’s minute-by-minute and item-by-item description of Michael Jackson’s last days, he should not be a target of criminal charges,” Chernoff said Tuesday. “Dr. Murray was the last doctor standing when Michael Jackson died and it seems all the fury is directed toward him.” Los Angeles investigators have interviewed Murray twice, Chernoff said. A third interview has not been scheduled, he said. Police impounded his car, which had been parked at Jackson’s Holmby Hills home, the night after Jackson’s death. It was released to Murray several days later. “Dr. Murray is frustrated by negative and often erroneous media reports. He has to walk around 24-7 with a bodyguard,” Chernoff said. “He can’t operate his practice. He can’t go to work because he is harassed no matter where he goes.” At least two investigations are under way into Jackson’s death. The Los Angeles County coroner is waiting for toxicology results to determine a cause of death, while the city Police Department, with assistance from the Drug Enforcement Administration, is looking at the possibility of criminal charges. A coroner’s office spokesman said the autopsy findings could be released in the next week or more. Los Angeles Police Chief William Bratton told CNN he would wait for the coroner to determine the exact cause of Jackson’s death. “And based on those, we will have an idea of what it is we are dealing (with): Are we dealing with a homicide, or are we dealing with an accidental overdose” he said.